There are two main methods to heating an enclosure, by means of a heat lamp or use of a heat mat or under-tank heater (UTH). A guard should be placed around the heat bulb if it is placed inside the enclosure, particularly with snakes as they have been known to wrap around a hot bulb and suffer terrible burns. ‘Hot rocks’ are sold as heating devices though they have been known to inflict burns on reptiles. It is believed that heat receptors are not the same as pain receptors so the reptile does not perceive the pain of a burn until it is too late. 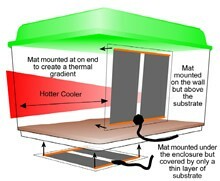 Heat mats can be positioned either vertically, on the wall of the enclosure or along the floor covering around 1/3 of the enclosure, so a warm to cool gradient can be established. If the heat mat is positioned underneath the enclosure it can be placed on the outside of glass or plastic enclosures but on the inside of wood vivariums as wood is a poor conductor of heat. 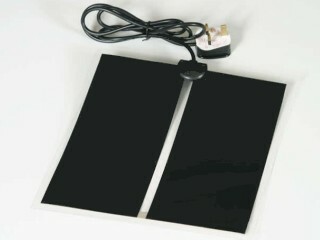 The heat mat is more vulnerable to damage when placed inside with the animal so this should be done with caution. A digital thermometer should be used to monitor temperatures allowing you to make appropriate corrections. Thermostats will provide you with accurate temperature control of heat lamps and mats. Each individual species will have its preferred range of temperatures, if the reptile is not in its Preferred Optimal Temperature Zone (POTZ) its metabolic processes would not be able to function properly. Below is a general guideline to a reptiles preferred temperature range. When deciding whether to use a heat lamp, UTH or both, consider the thermoregulatory behaviours of the species in your care. There are basically two types of behavioural thermoregulation – heliothermic and thigmothermic. Heliotherms bask in the sun for heat regulation while thigmotherms absorb heat by conductance from objects in the environment. Species such as Bearded Dragons, Spiny Lizards and Tortoises are heliotherms so will require heating from above to mimic the sun. Species such as Leopard Geckos, Royal Pythons and other nocturnal species are thigmotherms so will require heating from below to mimic a ground which has been warmed by the sun. Heat lamps may also be used to heat furnishings. 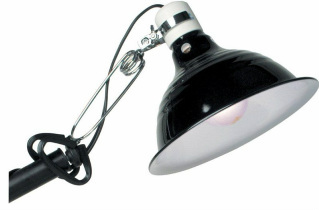 Heat lamps should be switched off during the night to keep the natural variation of day and night temperatures and also to provide a day and night light cycle. Many reptile owners do not realise that all reptiles must be provided with a day/night cycle in order to thrive. Some species of reptile such as the Iguana possess a 'third eye' called the parietal eye which is located on the top of the skull and is connected directly, via neural pathways, to the pineal gland in the brain.This 'eye' is responsible for informing the reptile about light intensity and daytime lengths, ultimately telling the reptile of the time of year and in turn will influence feeding and reproductive behaviours. Artifical lighting should mimic actual day lengths so not to disrupt the animals normal physiological processes. The behaviour of a reptile will alter in accordance to heat availability and time of day. For example snakes will coil to conserve heat and uncoil to cool. When conditions are too warm some reptiles may begin to breathe open mouthed, some reptiles may borrow or simply move between micro-climates. Desert lizards raise themselves up on to their toes to reduce heat conduction, desert tortoises may also hyper-salivate or urinate for emergency cooling by evaporation. Reptiles are highly adapted to the temperatures in their natural environment so keepers should aim to replicate these temperatures. UV lighting has a nutritional importance in reptiles, particularly diurnal (day) species as well as having a suggested influence on agonistic (social), feeding, reproductive and signalling behaviours in some species of lizard. The lighting used will also affect vision. In a study between the Bearded Dragon (which is naturally active during the day) and the Leopard Gecko (which is naturally active during the night), it was found that the skin of the Leopard Geckos back allowed in 10x more UV-B light than the Bearded Dragon, this may indicate that crepuscular and nocturnal species have adapted to compensate for the low UV-B exposure therefore may be evidence that even nocturnal species can benefit from small exposure to UV light. UV-B light is necessary in order to maintain proper Vitamin D3 and calcium levels within the reptiles system. UV-B light regulates the synthesis of vitamin D3 in the skin which in turn affects the metabolism and absorption of calcium. Although there are vitamin D3 supplements available, absorption by the skin is often much more efficient than ingestion. Different species require varying levels of humidity in order to thrive. Improper humidity frequently results in disease such as chronic renal failure in Green Iguanas due to dehydration, shedding problems in snakes and bacterial and fungal dermatitis in snakes and lizards with excessive humidity. Humidity can be monitored using hygrometers and maintained with appropriate ventilation and spraying/misting when and where appropriate. Waterfalls/water features, strategic placement of water dishes (e.g. in focal hot-spot), increasing surface area of water provided, and using substrates that retain moisture such as sphagnum and peat moss can raise humidity. Ventilation is necessary, even when a high level of humidity is required. Poor ventilation encourages a rapid build-up of air-bourne bacteria, viruses, fungal spores and chemicals which invites disease. Even arid-adapted species require humid microhabitats (humid hides) to aid in successful shedding.